Finally my new album is out!!!! You can listen to it for free and if you like it you can support the work of the label dharmasound and pay only 4.50 Euro for the download! 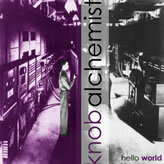 Hello World is the first album for the artist named knob alchemist. This project is very influenced by the world of the ITC (Information and Communication Technology) and the human behaviours. There isn’t a label to define the genre of this work, we can find here especially cold glitches that reflects the nature of machines, but non only. Noises, confusion, glitches and coldness are also peculiarity of the modern society, where human actors and artifacts become one thing in the socio-technical context. So born hello world, an abum that speak about the power of computer science and programming. Hello World is a 9 track work. All tracks are produced by knob alchemist except wo ist mein spielzeug where bent keyboards and speak&spell are played by EraSer and a summer’s dawn featuring the guitars and manipulations of Matte. 04~ wo ist mein spielzeug?